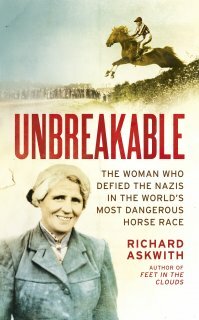 Come and join us for an evening with Richard Askwith, author of an evocative biography of Emil Zátopek, speaking about his new book Unbreakable and Lata Brandisová, the first and only woman to win the Grand Pardubice, the world’s most dangerous steeplechase, defying the Nazis in the process and winning the heart of the nation. Richard will be in conversation with Julian Wilde about the tale of courage and heartbreak, in an age of fear and prejudice: of sexism, class hatred, and nationalism. Czechoslovakia, October 1937. Europe’s youngest democracy is on its knees. Millions are mourning the death of the nation’s founding father, the saintly Tomáš Masaryk. Across the border, the Third Reich is menacing – and plotting to invade. In the Czechoslovak heartlands, vast crowds have gathered to watch the threatened nation’s most prestigious sporting contest: the Grand Pardubice steeplechase. Notoriously dangerous, the race is considered the ultimate test of manhood and fighting spirit. The Nazis have sent their paramilitary elite: SS officers schooled to be Hitler’s most ruthless enforcers. But there is one other contestant: a silver-haired countess riding a little golden mare… The story of Lata Brandisová (1895 – 1981) is one of the strangest and most inspiring in all sport. Born into privilege, she spent much of her life in poverty. Modest and shy, she refused to accept the constraints society placed on her because of her gender. Instead, with quiet courage, she repeatedly achieved what others said was impossible. The scandal of her first attempt to ride in Pardubice reverberated across Europe. Ten years later, she became her nation’s figurehead in its darkest hour. Unbreakable is a tale of courage, heartbreak and defiance, in an age of prejudice and fear. In the background are forces – sexism, class hatred, nationalism – whose shadows darken today’s world too. In the foreground are eccentric aristocrats, socialite spies, daredevil jockeys – and a race so brutal that some consider merely taking part in it a sign of insanity. At its heart is a unique hero, and a unique love affair between a woman and a horse. But equally, Brandisová’s story maps closely the history of the Czech nation – she lives through the break-up of Austria-Hungary empire, the foundation of Czechoslovakia and The First Republic and also the accession of Communism.